Some things never change. Pain and suffering are unacceptable reasons for not going to work. 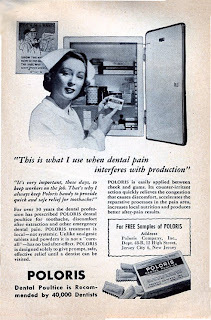 This ad is from 1948, and our pretty factory nurse is saying that tooth pain isn’t going to keep anyone from doing their job at the plant. God forbid that dental pain interferes with production! She, of course, would never consider missing work because she is a nurse. Even if she’s dying, she will crawl in on her hands and knees, and report for duty. Nurses are odd people when it comes to taking care of our own health. We will make sacrifices and do whatever is needed in order to care for our patients, but we won't take care of ourselves. 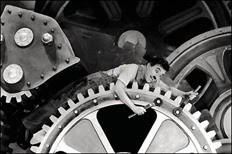 The health care system is like a factory, and nurses are cogs in the machine. Nurses are taught that the machine will breakdown if they don’t report for their shift. Most nurses feel guilty if they are unable to come to work. They know that their coworkers are going to have to work harder because they are short of staff. I’ve worked with nurses who have worked their entire shift with a fever, or while they were suffering from a gallbladder attack. And the situation really gets tough when nurses start having children. Many years ago nurses were expected to work right up until the stork arrived. I knew a nurse who went into labor at work, and the nursing supervisor asked her if she could pick up an extra shift as she was being taken into the delivery room. I, too, waddled up and down the halls of a medical-surgical unit when I was pregnant with my first child. One night I thought I was going into labor while I was at work. I was checking a patient's IV when I doubled over in pain and nearly passed out. I grabbed the side rail of my patient's bed, and the poor man freaked out. I remember him yelling, “Someone, help! My nurse needs a nurse!" My daughter was born two days later during my day off from work. I lucked out. A doctor once told me that nurses make the worst patients. He was a very wise man. A.M.E.M. It's ridiculous to think that you can effectively take care of sick people why you, yourself are sick. Don't even get me started on working during the third trimester. When I complained about this, my MIL (who is a retired nurse) said, "Back in my day we didn't need all this time off during pregnancy. We worked right up until the last minute." OOPs. I meant to say, "AMEN." So TRUE! I actually posted about that when I was sick last month. And working while in labor? My mom did that exact same thing.She was working for a cardiologist and in the CATH LAB at the time. She finished out the procedure and waddled downstairs to L&D and six hours later gave birth to me. It's too bad we do this to ourselves. I've worked with nurses who have, too, had fevers, had diarrhea, vomiting, fallen but not gone to ER until after their shift to find they've broken their foot, and one nurse who went into labor but finished her shift before hooking herself up to a fetal monitor. She was 7 cm when she was checked. Doctors aren't exactly great patients, either, but it is that twisted sense of responsibility to everyone but yourself that is so common among those in the professional caregiving community. That doctor on the bottom picture seems to be thinking "That's another one gone." please send aforementioned nurses here post-haste. our crew, generally great, is understaffed, burned out, and is not averse to the pre-shift call in. I found the ad in an old 1948 RN magazine that I picked up on eBay. Keep watching for more ads. I'll be posting them soon.